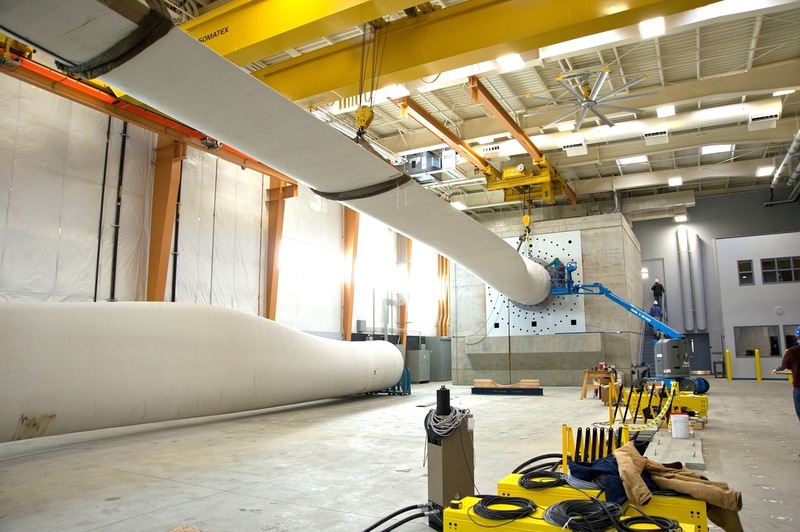 We completed static strength testing of a 56-meter (184-foot) wind turbine blade for Gamesa, a global technological leader in the wind industry which is based in Spain. Juan Diego Díaz, the marketing director for Gamesa, said, “North America was a logical place to conduct this important step in our product development, supporting our growing commercial opportunities in that region and globally. 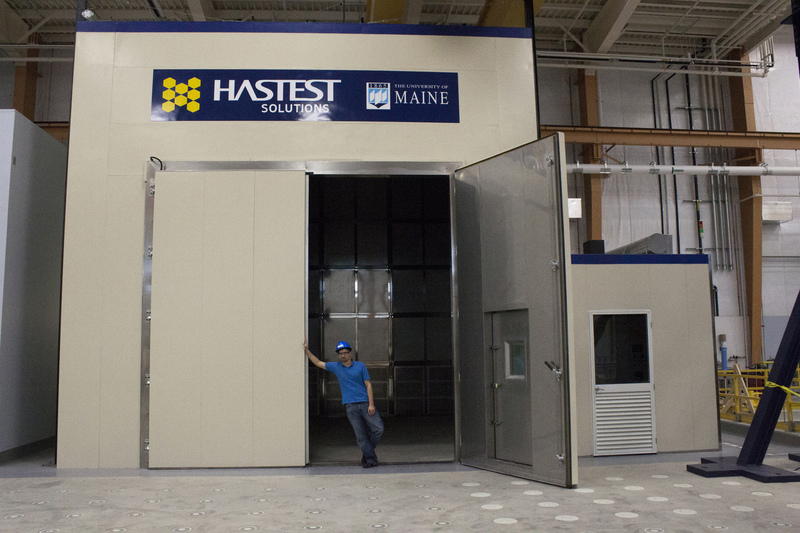 We were impressed by the testing quality, safety and attention to detail provided by the UMaine team in successfully testing our blade.” Image is courtesy of Gamesa. The reaction wall's static capacity is more than 30,000 kN·m and fatigue capacity is more than 20,000 kN·m. Our strong floor accommodates structural testing of blade or other products up to 70 m in length. Our 300 m3 chamber offers a temperature range of -40 to +50°C relative humidity range 20 to 95%, and ramp rate in thermal cycling ±10°C per hour. 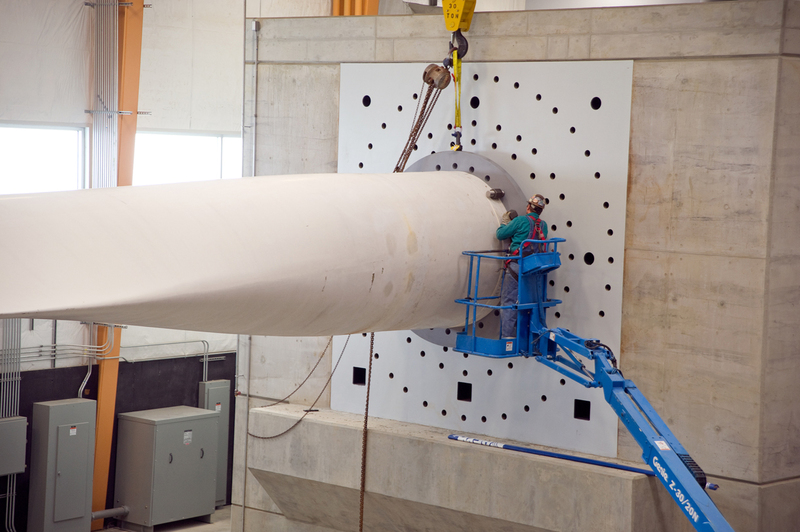 Reinforced concrete test stand capable of testing wind blades, towers, foundations, and other structures up to 230 ft (70 m) in length in both static and fatigue testing modes. 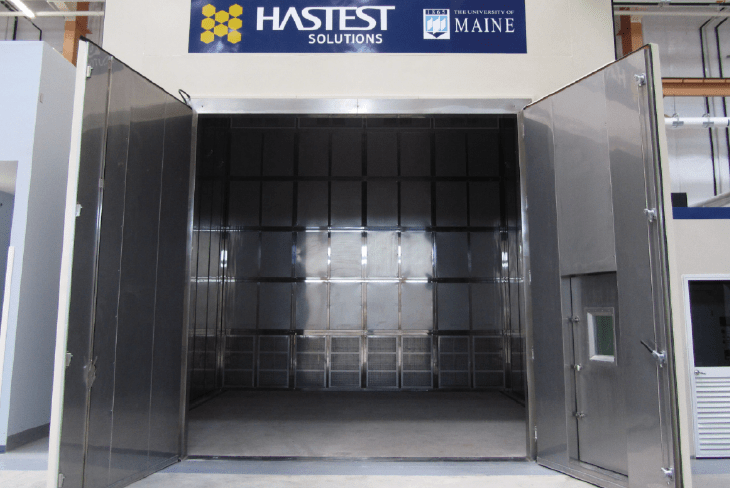 Capable of simulating the extreme temperatures and other conditions of offshore environments, this chamber can be outfitted with load frames and actuators to apply loads to your components during testing. 22′ x 22′ x 20′ (6.8 m x 6.8 m x 6.1 m high).